Anyone who expected Joe Schmidt to experiment with his squad for the upcoming three-Test tour of Australia hasn't been paying attention. If the World Cup was starting next month, this is the squad (minus one player to fit the 31-man panel allowed) the head coach would pick. This end-of-season trip Down Under is seen as a critical step towards next year's tournament; a window to build on the Six Nations success and to make a statement of intent by securing a first southern hemisphere series win since 1979. There are those who want the coach to rest his big names, to take the Lions out of the firing line and go with the young guns. That was never on the agenda. The players got their rest during the campaign and Schmidt gets little enough time together with his players to leave them at home for a World Cup dress rehearsal. Presuming the Leinster players and Tadhg Beirne come through Saturday's Guinness PRO14 final unscathed, the 32-man panel named yesterday will be confident of securing a series win in Australia. Indeed, privately, they'll be targeting a repeat of the clean sweep England achieved against Michael Cheika's side two seasons ago. 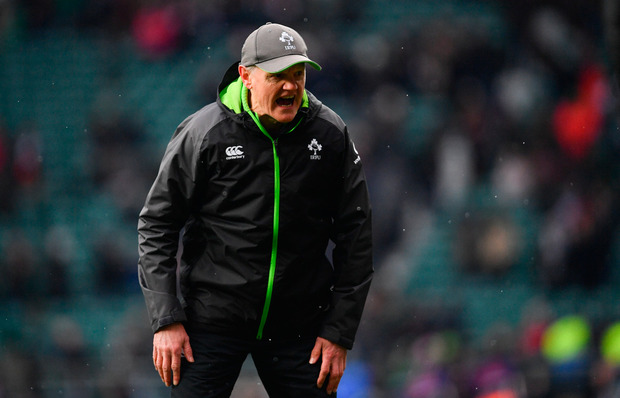 With assistant coach Paul Gustard jumping ship for Harlequins, Eddie Jones' juggernaut has well and truly lost its sheen in the past year and, suddenly, Ireland look like the chief rivals to New Zealand in Japan. Traditionally, that has not been a comfortable position for Irish teams to occupy, but one of Schmidt's stated ambitions when he took the job was to make them more comfortable with the favourites' tag and they will certainly travel with a weight of expectation next month. airwaves Australian rugby is at a low ebb, but no one in Irish rugby would underestimate a Cheika-coached team. The former Leinster supremo has already hit the airwaves playing up the arriving Grand Slammers as favourites, but the bookies don't agree. Most are calling it as a scratch series, but others are leaning towards a home win. Two seasons ago, while England were dominating at the same venues Ireland will visit, Schmidt took an injury-ravaged squad to South Africa and lost a series they should have won 2-1. They'll want to rectify that this time around and, fitness permitting, should have a similar side to the one that beat England in Twickenham on St Patrick's Day available. Doubts exist over the fitness of Iain Henderson, Robbie Henshaw and Bundee Aki, but Schmidt wouldn't bring them if they couldn't contribute. In South Africa, he picked his strongest side for the first Test in Cape Town and rotated heavily for the second game in Johannesburg; opting to hand first starts to the likes of Tadhg Furlong and Quinn Roux, before picking his best available XV for the finale in Port Elizabeth. Expect a similar pattern here, with the team locked and loaded for the opener in Brisbane and the coach will go from there. Yesterday, he described the selection as one of the toughest he's faced since taking charge but he has the luxury from a settled squad that is relatively low on injuries. Seán O'Brien, Josh van der Flier and Chris Farrell may have forced their way in, but at this stage of the season this is a strong position for the coach to pick his team from. He will have them in camp for a few days next week before the squad make their way to the Gold Coast where they will acclimatise initially before making their way to Brisbane. He has his first- and second-choice front-rows available, his preferred second-rows and, while O'Brien and Van der Flier would argue their own case for inclusion - a formidable back-row trio and some excellent cover options. Conor Murray and Johnny Sexton are a world-leading half-back partnership, picking between Aki, Henshaw and Garry Ringrose is the kind of difficult choice coaches love and hate, while the back-three options are strong with Andrew Conway and Jordan Larmour challenging the established trio of Rob Kearney, Keith Earls and Jacob Stockdale. There may be a chance to get some experience into the reserve half-backs and it would be no surprise to see Joey Carbery start one of the three Tests; while Kieran Marmion and John Cooney are decent back-ups for Murray. Ross Byrne and Tadhg Beirne are rewarded for their strong seasons and will hope to contribute. It is likely that all 32 will see some game-time. Cheika names his squad next week against a backdrop of 39 successive Super Rugby defeats for Australian franchises against New Zealand opposition and the rumbling controversy over his star Israel Folau's comments on homosexuality. He is expecting a very difficult trio of games. "How we were changing the team around and where we are now, with Grand Slam champions coming now, I think it is a good gauge (of where we are)," he told reporters in Sydney. "It's going to be tough, but we're looking forward to putting ourselves up against a contrasting style of play. "They are obviously very well-coached, they've got a clear and coherent plan they want to deliver and they deliver that plan every week. "That's what's got them to number two in the world and it's a place that we'll be looking to cut them down from when they come over here." It is the strongest possible squad and one more than capable of winning the series. Australia are ranked fourth in the world and have plenty of talent on their books, but an unforgettable season for Ireland can carry into June.